Real Madrid are headed to the Champions League semifinals thanks to a 6-3 aggregate win over Bayern Munich. But it wasn’t as straightforward as the scoreline might suggest. The tie went to extra time after 180 minutes left them tied at 3-3, with two away goals apiece. 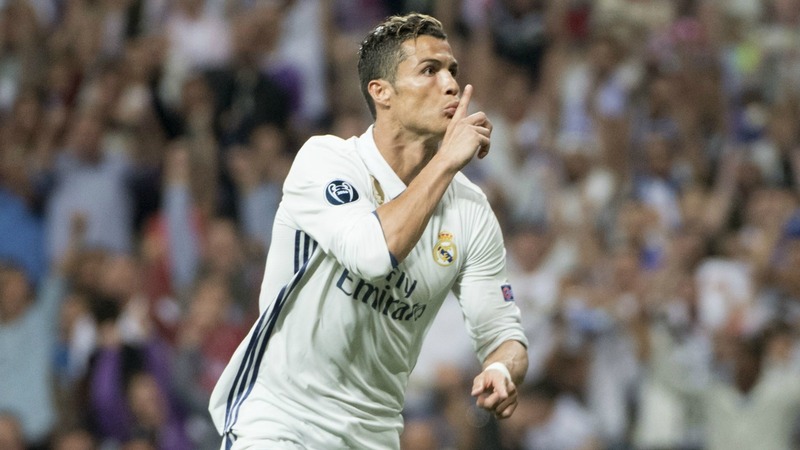 And even though the Merengues poured it on with three extra-time goals, it wasn’t without controversy. Bayern Munich will feel like the referees robbed them in the tie. Do they have a point? Let’s start with this: Bayern should absolutely be furious and the refereeing unquestionably robbed them a chance of winning the tie. The refereeing controversy didn’t start in Madrid either. Bayern were upset in the first leg when Javi Martinez was sent off for two yellow cards. 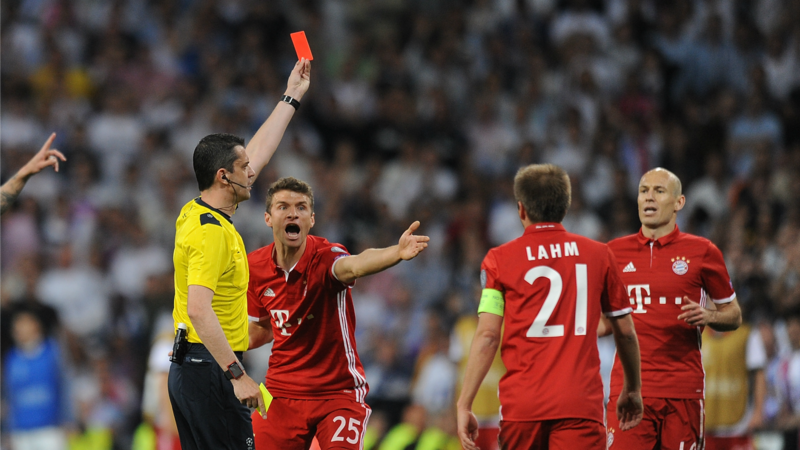 While those cards were plenty justifiable, the second one, in particular, didn’t leave the referee without a choice and making Bayern play down a man for the final 29 minutes, during which Real Madrid scored the winning goal, did not leave the men in red feeling especially cheery about the officiating. That paled in comparison to what we saw in the second leg, though. It started when Vidal was shown his first yellow card. The midfielder plays on the wild side to begin with, so making him play with a yellow is tough, but it looked like he would get away with it. After all, the referee let both teams kick and block each other for most of the second half. Vidal even stomped on a Real Madrid player and got away with it. It was a free-for-all, and it didn’t even ruin the match. It was both brilliantly entertaining and reduced the risk of anyone getting sent off. Then, in the 84th minute, Vidal made a tackle that saw him get the ball, but also Marco Asensio. Somehow, this was deemed a yellow card offense and Vidal was sent off. Now there’s a world in which that is a reasonable yellow card. Yes, Vidal got the ball, but he also got Asensio and it was borderline dangerous. Combine that with the many other offenses Vidal had in the match and you could justify sending him off for this tackle. But that’s only in a match where the standard of this being a yellow card offense — or even close to a yellow card offense — had been established from the start. This match was the opposite, where much worse was allowed to pass. Because of the referee’s bizarre decision, Bayern were down to 10 men. Playing down a player away to Real Madrid is bad enough, but toss in that Bayern were playing with Jerome Boateng and Mats Hummels at the back, a pair of players who entered the match as injury doubts and would now be expected to play 120 minutes, the last 36 of which would be down a man. As if having just 10 men wasn’t enough, Bayern were then burned by the linesman when Cristiano Ronaldo put Real Madrid ahead in extra time. While Ronaldo’s finish may have been clinical, he was blatantly offside. So not only were Bayern unfairly down a man, but they were also unfairly down a goal. And then Ronaldo scored again. And again he was offside (although this time it was very close). Real Madrid would go onto score one more goal, with Asensio finding the back of the net, but by that point, Bayern were done for. They were run ragged, had played too long down a man and were two (offside) goals behind. You can explain away one bad call in the bunch, but two? Three? And that’s without even going to back to the first leg. Bayern Munich absolutely got screwed here and are rightfully furious. That said, they weren’t robbed of the tie. To say so would be to imply that they would have won it had the referees not made bad calls. The Martinez red card in the first leg was entirely justifiable and, to many, right. Then the Vidal red card and offside Ronaldo goals all came with the tie even at 3-3. Had the referees got it right, Bayern still would have had to do plenty of work to beat Real Madrid, especially with Boateng and Hummels struggling in extra time. Bayern Munich weren’t going to win the tie if it wasn’t for the referees. But the referees did rob them of a chance to win the tie. That is inarguable, and a real shame in a matchup that was nothing short of brilliant otherwise.